Seeking that which is life giving. With white smoke rising over the Vatican 1.2 billion Roman Catholics welcomed Cardinal Bergoglio from Buenos Aires, Argentina as their new Pope. A theological conservative, Cardinal Bergoglio is also known for his compassion — a combination reminiscent of Archbishop Oscar Romero of El Salvador or Dorothy Day of the Catholic Worker Movement. In Buenos Aires, the cardinal showed real compassion for HIV victims, and he sternly rebuked priests who refused to baptize children born out-of-wedlock. There are also reports of the new pope being a “bridge builder” between Jesuits and other orders and, more widely, between conservatives and liberals in the church. How welcome that would be. As the first Pope from South American, I am impressed by his sensitivity towards the poor and the world’s massive inequality — from the perspective of one of the world’s poorest places. Reflecting this sensitivity the new Pope has chosen the name Francis. His namesake, Saint Francis of Assisi refused the trappings of power and possessions and chose to enter into deep solidarity with the poor, forgotten, oppressed. In his famous prayer he asked that he become ‘an instrument of peace’. And, Kent, I add my prayers to yours with a heartfelt Amen. I don’t believe that our faith should be confined to a structure or organization, but first to the almighty Spirit of God which we show through our interactions with the needy. I anxiously await the new pope’s views and leadership. 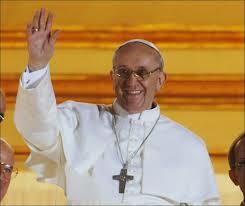 I pray for him and that his leadership will move the whole religious world forward. not just the Catholic church. This is indeed a time to pray for rewnewal and restoration within the Roman Catholic Church and indeed in all of Christianity.